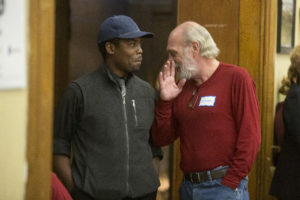 Zach and Jason converse while handing out UltraShorts at a StorySlam. Photo by Art Montes. 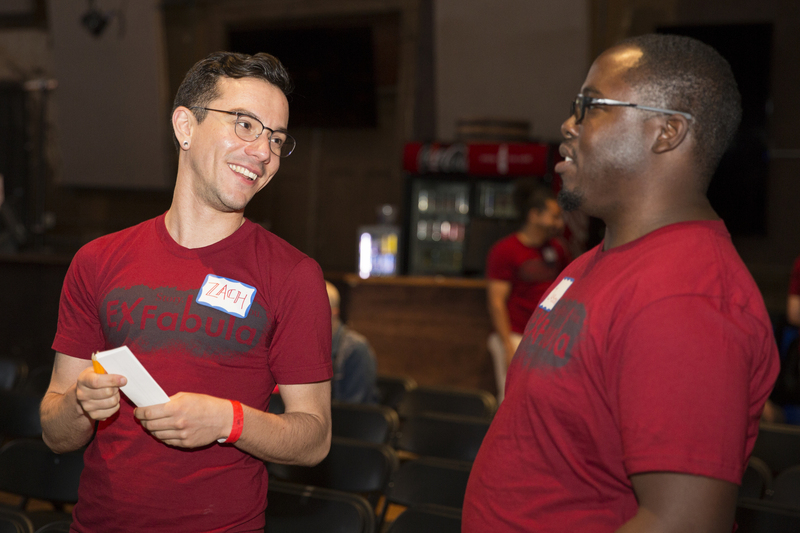 Ex Fabula would not have made it to Season 10 without its group of dedicated volunteers. Volunteer opportunities include anything from assisting with events to more independent, flexible projects. We hope you’re able to find your niche and contribute your talents to the team. Before volunteering with us, we ask prospective volunteers to attend an orientation. Click below to RSVP for the next volunteer orientation and become a volunteer! It’s the start of a new season, and we want to get the word out! We still need to post Season 10 fliers in a number of neighborhoods. Email me at sam@exfabula.org to help out! We’ll give you everything you need. Ilonna passes along surveys to guests at a StorySlam. Photo by Art Montes. We rely on committees comprised of staff and volunteers to advise on the direction of our operations and programming. If any of the committee’s below are of interest to you, email Sam Woods at sam@exfabula.org with the committee you’re interested in and a little bit about you and your background. Our Programming Committee meets monthly to discuss the timing and functions of regular season StorySlams, Secret Fabula events, and other programs. The time commitment is around 3-4 hours a month. 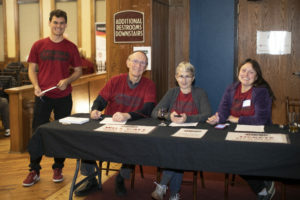 Ex Fabula’s Community Connector Sam Woods poses at the front desk with volunteers Russ, Sue, and Rebecca. Photo by Art Montes. 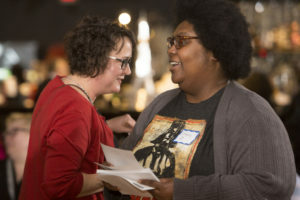 Ex Fabula’s Board is a diverse group of dedicated volunteers who advance Ex Fabula’s mission through strategic planning, fundraising, monitoring progress toward goals, and oversight of the Executive Director. Learn more about them here.